It’s usually at about this time of year when my interest in wearing cute shoes starts to wane and my desire for comfort and warmth takes over. The tricky part is to find winter boots that do the job and still align with my personal style. Being the stubborn Taurus that I am, I’m just not willing to sacrifice all form for functionality and according to what I’ve gathered from messages and emails from many of you, it’s clear that you’ve had the same struggle. Over the last several years I’ve been testing out boot options for a wide range of weather because in southern Ontario we see it all over the course of a winter season. From bitter cold to fresh powder to sloppy slush to slick ice to salty streets and just about everything in between. This means that one pair of boots usually can’t handle everything so having a couple of options depending on the conditions has been my approach. 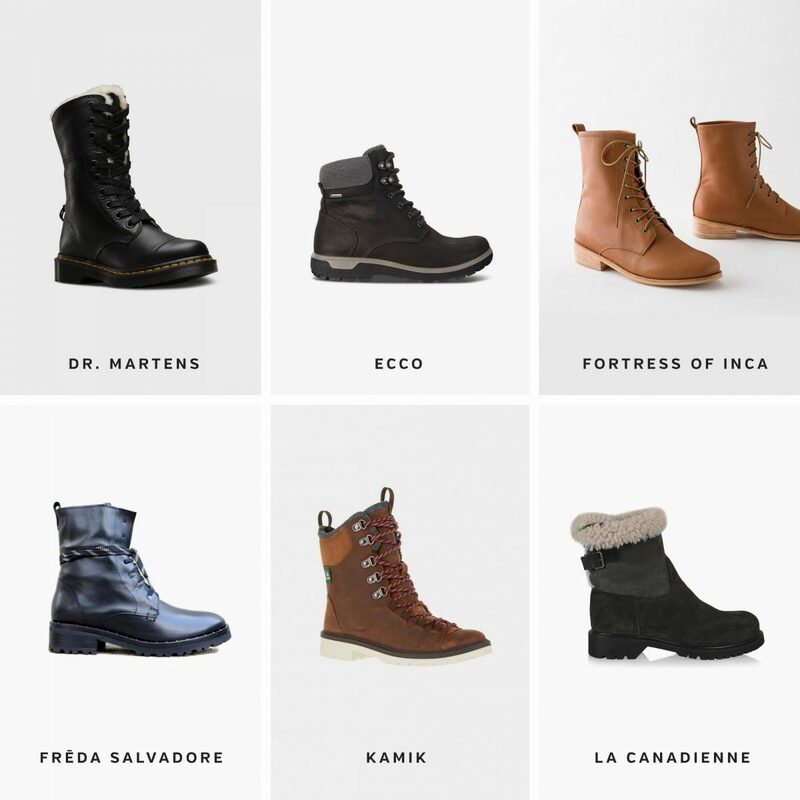 Today I’m sharing those options along with a comprehensive list of 18+ boot brands that I’ve bookmarked for the next time I’m ready to solve a weather related footwear dilemma. 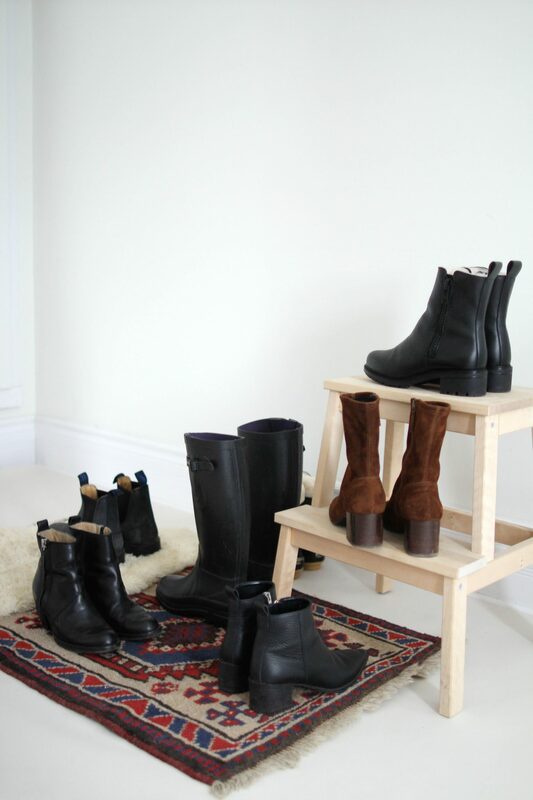 My boot collection has amassed over many winters and although it’s more shoes than I need I felt it was worth sharing all the ones I actually wear on a regular basis in case certain styles might be right for you. 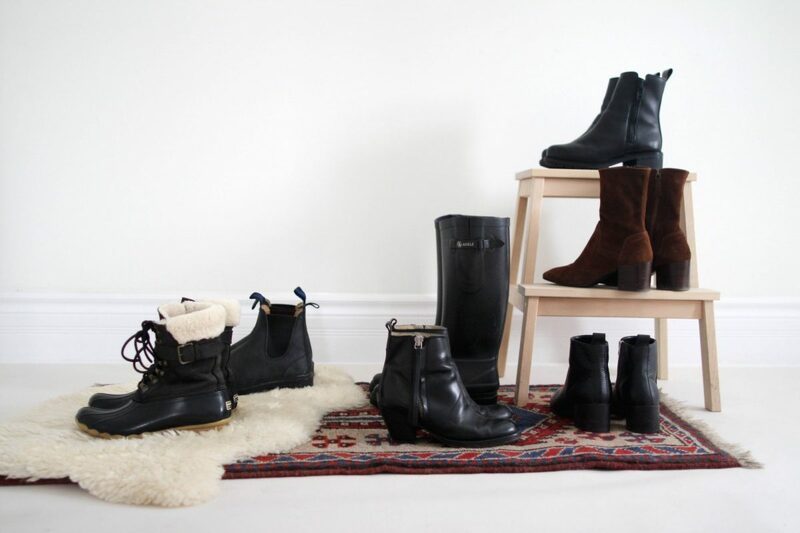 The boots in my closet are not all from responsible brands, many I bought long before I was shopping thoughtfully, but I’ve included them because they do the job and I’ve had them for many winters so I know the quality stands up. 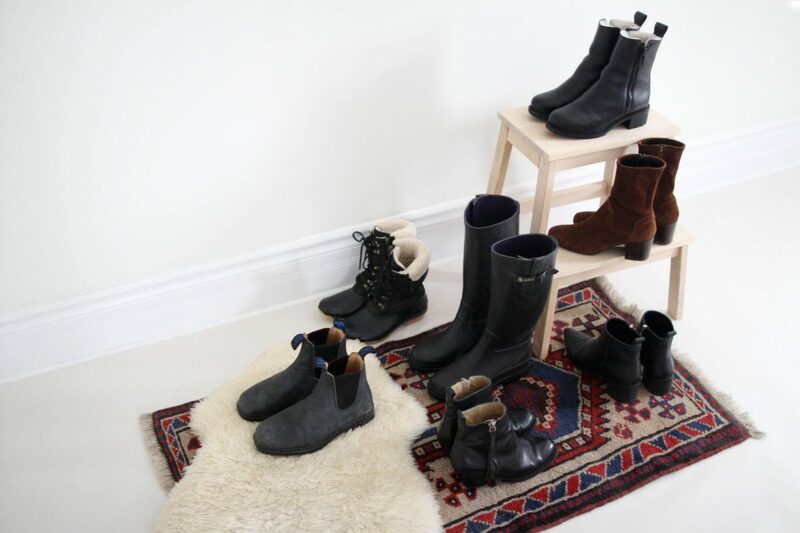 I’ve included the basic information about each boot below including: the brand, specific style, price, size/fit, weather conditions they are suitable for and how long they’ve been in my closet. I’ve also included where they were produced and a link to the company’s manufacturing information. The first four boots are the ones I’ve worn most this year and the others are some I’ve had for several winters and wear often. FOR SIZE REFERENCE: I wear size 7/7.5 and have a narrow foot with a high arch. Fit – TTS (I have a size AU4 = US 7) The fit is roomy but comfortable with a range of sock thicknesses. Shearling and leather insoles are removable. Suitable weather – These are waterproof and great for any weather except deep snow and extreme cold. Time in my closet – 1 season – I’ve only had them since the fall but Dave (my husband) has had a pair in rotation for years and swears by them. He even bought the steel toe work boot version and wears them on site daily (he’s a builder/renovator). Made in Vietnam – See Blundstone’s Company Values here. Fit – Runs slightly small (I have a 38) The fit is roomy but comfortable with a range of sock thicknesses. Insoles are not removable. 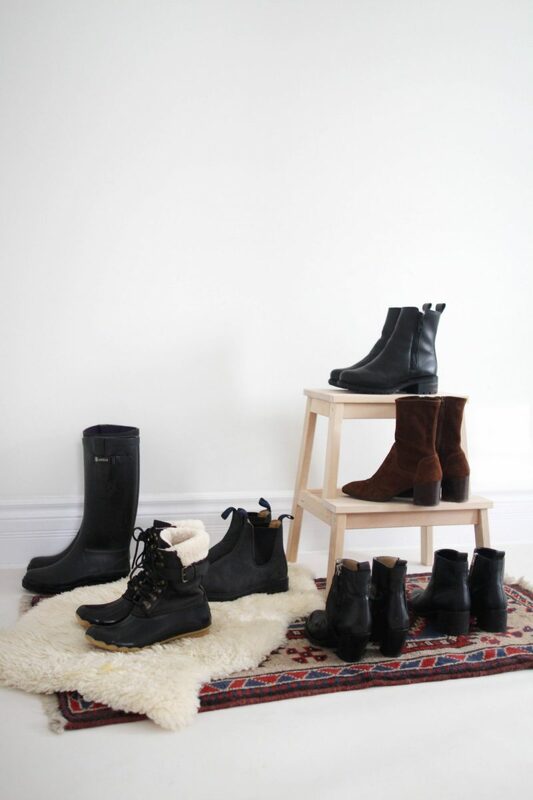 Suitable weather – These are the quintessential rain boot. The rubber is softer than Hunter boots so it’s more flexible and less inclined to crack but they’re not intended for extreme cold. Winter version available here. 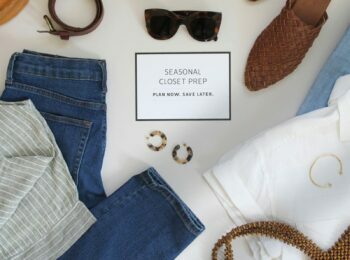 Time in my closet – 1 year – I bought these last Fall knowing we’d be heading out west and they’ve been great. My only complaint is that the insole started to curl so I had to rip them out. Made in France – Learn about AIGLE’s heritage & craftsmanship here. Fit – TTS (I have a size 7) The fit is snug but comfortable with a cotton dress sock. Size up 1/2 size if you want to wear a thicker sock. Suitable weather – These are weatherproof suede, however, I’m not planning to wear them is very wet, slushy, salty or extreme conditions. They’re great because I don’t have to worry if they do get wet or I get caught in an unexpected flurry. With a regular sock they’re quite warm down to about -10ºC. 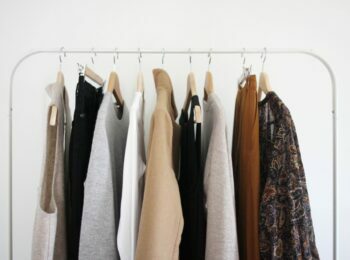 Time in my closet – 1 season – I bought these earlier this fall and I’m so glad I did! They’re so comfy to walk in and they work with everything in my closet, especially cropped pants. Made in Italy – See Aquatalia’s Company Values here. MAGUIRE – RACHEL LEATHER BOOT SHEARLING LINED – $345 CAD – Suede & Leather combo also available. Fit – Runs slightly small (I have an 8 but tried the 7 first, which was too tight/short) The fit is snug but as the shearling liner packs down they get roomier. Suitable weather – Aside from really deep snow I think these will be ready for any weather this winter wants to throw at me. They are very warm so no need to wear thick socks inside. Time in my closet – 1 season – After missing out on a pair last winter, I bought these earlier this fall and I’m obsessed with them! They’re SO comfy, cozy, easy to put on and very walkable. The tread is great for snow and slippery surfaces too. I have a feeling these are going to be closet game-changers this winter. Made in Montreal, Canada – See Maguire’s manufacturing practices here. 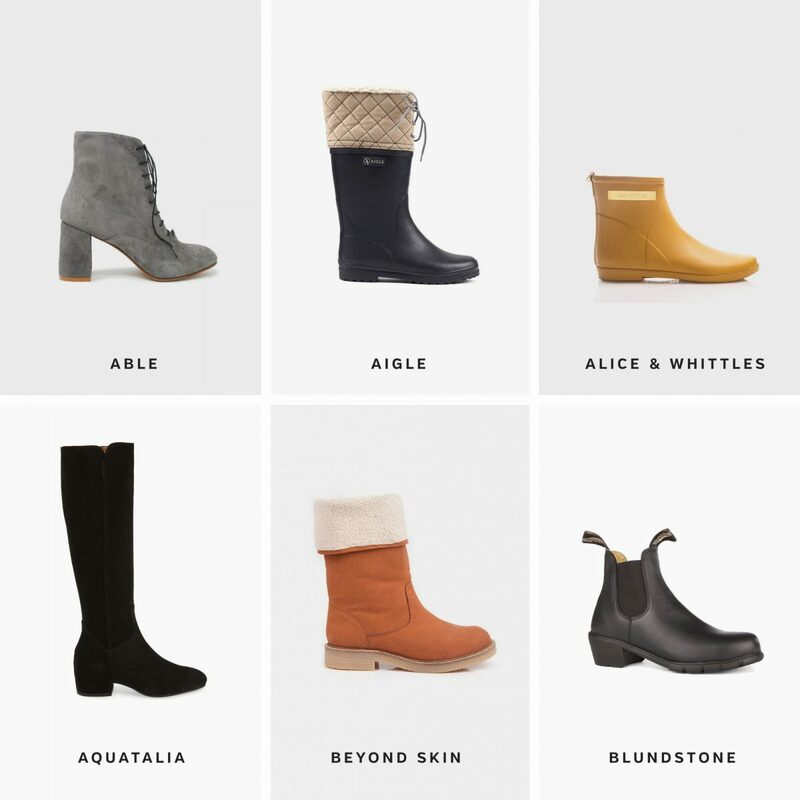 ALICE & WHITTLES – MINIMALIST RAIN BOOT – $108 CAD (on sale) – Free US + CA shipping plus a 1 year warranty. Fit – Runs Small (I tried the 7 but sized up to an 8) Fit is roomy but comfortable with a range of sock thicknesses. I do find that my heel slips up often when I walk in them so the fit isn’t perfect. Suitable weather – Waterproof but not warm. You will need a thick sock if you wear these in the winter below 0ºC. Time in my closet – 2 years – I bought these a couple of springs back after hunting for a truly minimal, low cut rain boot that was made ethically. These fit those requirements perfectly. Made in Sri Lanka from sustainably sourced rubber. Learn about A+ W ethics here. Fit – TTS (I have a 7) Fit is slightly roomy but very comfortable. Suitable weather – Warm and totally wearable in some snow and rain but not crazy cozy. You’ll want to wear a wool sock if you’re wearing them in temps as low as -10ºC. Time in my closet – 5 years – These are probably my most worn ankle boots to date. They’re very well made and the style is timeless. Made in Italy. See Acne Studios corporate responsibility here. Fit – TTS (I have a 7) Fit is snug but leather gives to fit as needed. I wear them with a cotton dress sock. Suitable weather – Fairly warm and wearable in light snow and rain but I don’t let them get soaked. Good down to about -5ºC. Perfect for an office. These are also very comfortable. Time in my closet – 1.5 years – I personally think these are probably the best value black ankle boot on the market. 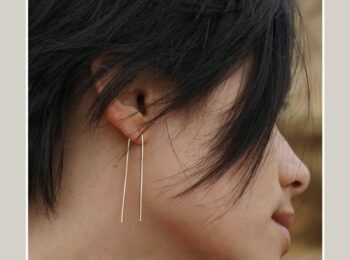 They’re very well made and the style is sleek and timeless. Made in Lastra a Signa, Italy. – Learn about the factory here. Fit – Slightly Small (I have an 8) Fit starts snug but loosens as the shearling lining packs down. Most sizes are sold out but they seem to restock regularly. Suitable weather – Warm, waterproof and great for any winter weather. I love how easy they are to zip on. Non-slip tread is great but will wear down over time. Good down to about -15ºC but as the shearling gets older it looses its warmth. Time in my closet – 5 years – These have been my go-to winter boot for many years and I have found the quality to be excellent although some wear and tear is expected with time and use. Made in China. 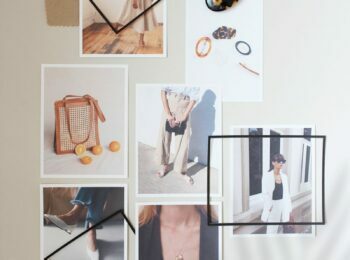 – Learn about J.Crew’s social responsibility here. Fit – TTS (I have a women’s size 7). Suitable weather – Very warm and heavy-duty for any major winter weather you may encounter. The weight of these is significant and probably the main reason I don’t wear them except during extreme weather conditions, as in -40ºC. Time in my closet – I’ve had these for probably about 10 years now and don’t foresee needing to replace them for many years yet. Made in China. 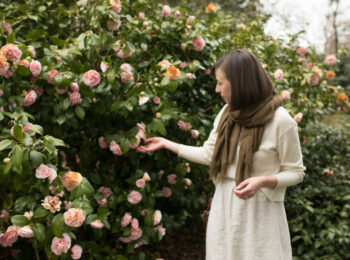 Learn about Sorel’s social responsibility here. RACHEL COMEY – THORA BOOT – Sold Out but I think a good Chelsea Boot is great for any closet. – Linked to a similar Chelsea style option for less. These look like they’ll be good in some cold weather and a variety of elements. I would size up to accommodate a thick sock to make these feasible down to -10ºC or so. Made in Lastra a Signa, Italy. Learn about the factory here. Find many of the brands noted above at ALTITUDE SPORTS. My first stop when looking for good outdoor footwear. I hope this post points you in the direction of some good winter boot solutions, wherever you might be located! If you have any other brands that are worth noting, please let me know! This post is not sponsored but it does contain affiliate links. If you choose to shop through the links above I may make a small commission on a sale. I only share brands and products that I genuinely believe are worth noting and all opinions are, as always, my own. Thanks for supporting the brands that support Style Bee! Thanks for the recs! Do you find the Maguire Rachel boots to be heavy? Also do you find they run TTS? Thanks! this is so helpful! i would love a post just like this for warm winter coats! 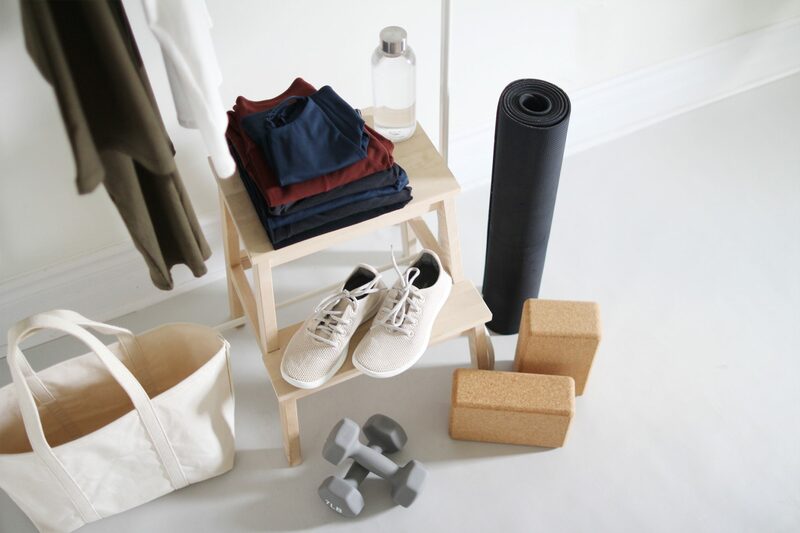 You did not mentioned the Everlane Day Boot. Have you tried them? I purchased the chocolate Aquatalia boots during the Nordstrom sale, and I’m so glad I did. Spending $200+ on a pair of boots was quite the splurge for me, but they are a great investment. They are beautiful, waterproof, soft, and unbelievably comfortable – even with the heel. 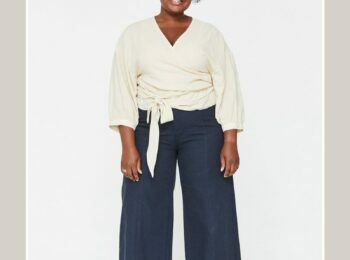 I’m very impressed and love that I can wear them with wide leg pants! Thank you!! I’ve been scouring the web trying to find northern winter/snow appropriate sock boot (taller bootie) boots for some time now to no avail. This is a great list! Thanks for this Lee! I bought the aquatalia boots because of you this year and they are the best. I love this roundup. I am in Montreal for 5 weeks. The Maguire Rachel boots are perfect for me. I will check them out. Thursday Boot Company is an ethics-focused company some attractive shoes. I’ve tried on a pair that unfortunately weren’t a good fit for me, but the quality seems good! Thanks so much for the suggestion Alice! Thursday Boot Co. looks great and I really like some of their styles. Glad to add them to the list! My heart almost skipped a beat when I saw the Maguire Rachel boots were in your lineup! I treated myself with a pair of the black suede/leather combo this year and I could not be happier! These are by far the best winter boots I’ve ever owned, stylish yet keeping my toes toasty warm even while waiting for the bus at -25Celsius. Special mention also to La Canadienne, Anfibio and Saute-mouton also made in Canada. So glad you love your Rachel boots too Maude! Thanks so much for the other suggestions. I’m LOVE the Anfibio Soutana boots and have them on my list for potential options next year. So happy to discover more great Made in Canada brands! 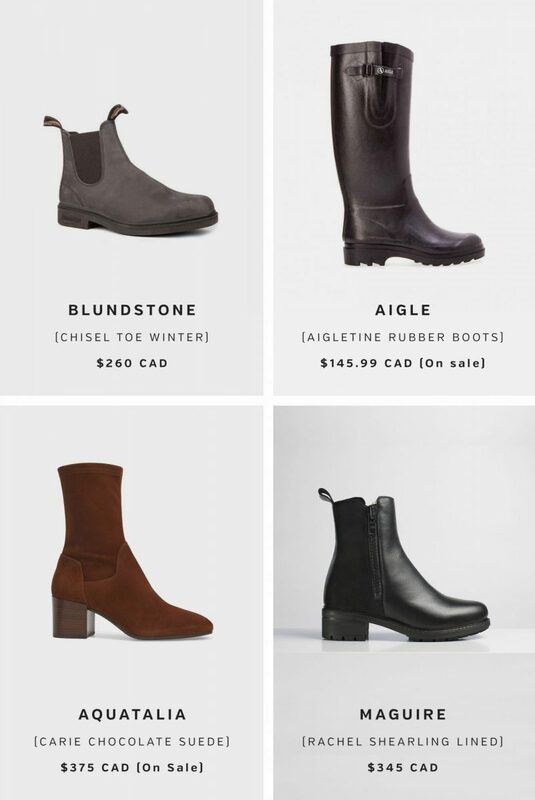 Don’t forget Blondo — another great Canadian brand — fashionable but weatherproof for Canadian winters! Thanks for the Blondo suggestion Susan. I couldn’t find any information regarding their manufacturing practices but when I spoke to a rep they said they were currently made in China and I would need to request production info since they don’t share it on the website. Unfortunately, this lack of transparency isn’t a great indicator of ethical practices but we’ll see what my inquiry turns up! Love this post, recently moved back to Minnesota after living on the west coast and had a rude awakening last winter! So many variety’s are needed- love your collection. Wow!!! So glad I’m not the only one that requires many options for winter weather. Great info & options to look into. Can hardly wait to show my husband your collection. He was just teasing me the other day about how I decide which ones to wear?? Haha I’m a shoe girl at heart for sure! No sense pretending otherwise 😛 I’ve found that winter in Ontario is a lot easier to face in a great pair of boots. Thanks for reading! Thank you for this informative and comprehensive post. Thanks so much for this great tip Brenda! I’m definitely going to look into those Paja Ice Grippers. I know it can get pretty treacherous. Glad you’ve got a great solution for walks with your big pups! Even my little guy can pull me off balance on the ice. Do you have any thoughts on Kodiak? I’m not personally familiar with their manufacturing practices but from my understanding, it is an ON made brand?? Hi Alissa!, I’m so glad you asked this because I knew I was forgetting some good options! It looks like Kodiak does make their boots in Canada, I couldn’t find info confirming Ontario but that’s totally possible. I was on their site this afternoon and it looks like they’ve got some great options at really decent prices. Officially added to the list. Thanks so much! 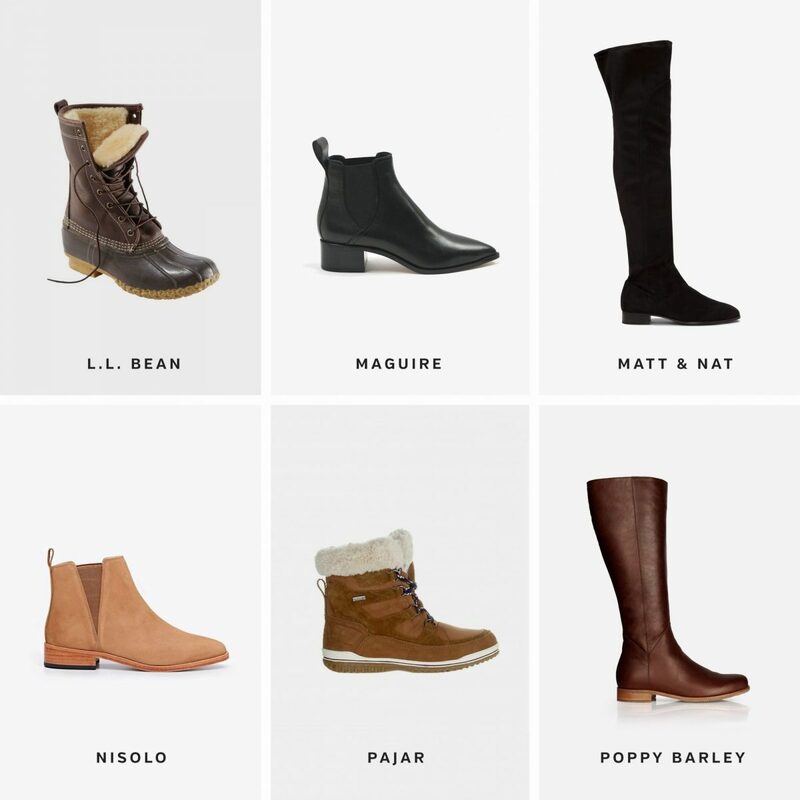 I loved this round up, the Everlane boots are beautiful!